Silverstone Technology made it all the way to North America with a few of their cases destined for the local market. 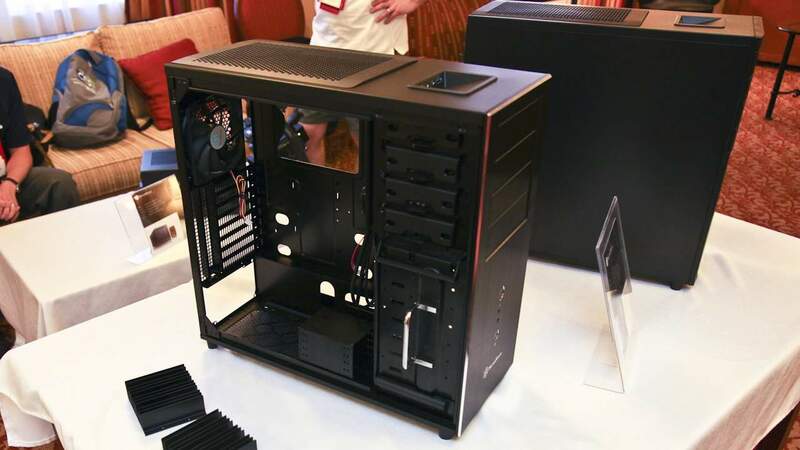 While we normally see them showing off their super high end cases like we did at COMPUTEX 2011, Silverstone decided to bring out products that were a little bit more budget friendly, but still showed off their ability to innovate. Yes, they left that 6 GPU carrying beast back in Taiwan but they still had cool things to offer folks looking for mid-towers and HTPC cases. Here's what we saw in 1080p HD above or direct on YouTube. Silverstone has finally completed work on their TJo4E and KLo4E mid-tower cases. These two are actually brothers from the same mother, but differ in the accessories that come with it and the style of faceplate. The TJo4E has the diamond cut edge finish aluminum faceplate and a number of accessories to help you access the nine drive bays inside. It'll even include a windowed side panel. The KL04E will have more plastic, a non-windowed side panel, and fewer accessories. For both cases, they've improved cooling and dust reduction and the ability to fit large graphics cards making them a couple of the highest performance mid-towers out there. The TJO4E will retail for $150 US and the KL04E will go for $120 US. 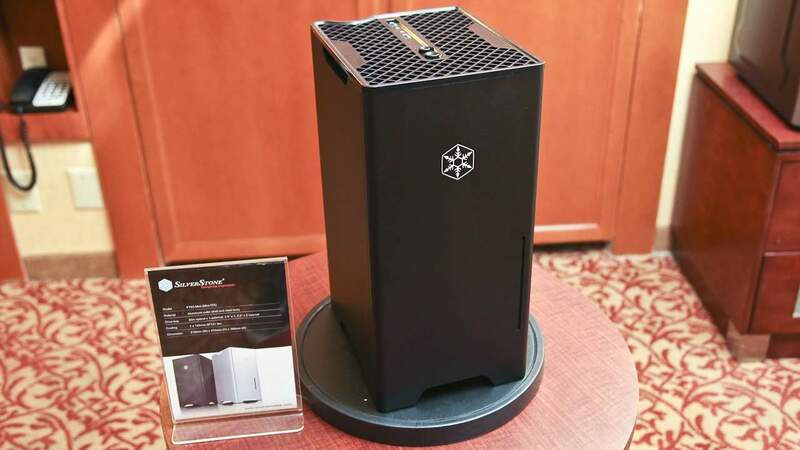 Silverstone improved their HTPC case series by including extra capacity and drive bays. For starters, their revisions have allowed up to five 120mm fans inside the enclosures now. The GD series also sees a revision that omits one drive bay, dropping it to seven 3.5 inch drives, but gives you space for two optical drives for your Blu-ray and old HD DVD collection. It even has a door that locks and an LED that you can vary the intensity on, so it's not distracting during movie night. Pricing will stay the same and the improvements will simply be rolled into new shipping cases. The FT03 was known as the "garbage can" case. But for some, this can was way too big. Silverstone responded with a small revision that uses only mini-ITX boards and SFX power supplies making it nearly HALF the size of the oiginal. The new FT03 Mini is easier to disassemble and build thanks to its more complete disassembly, cleaner and slightly quieter because of the components inside and the omission of the fan vent on the side. They expect to launch this for $130 US without the power supply, though the company is working on a 450W SFX PSU model with 80PLUS Gold efficiency. Speaking of shrinking things, Silverstone wants to return power supplies to the original ATX spec which is a power supply that is no bigger than 140mm. Based on the work they've done cramming as much as they can into their signature 450W SFX PSU. They showed off a 600W 80PLUS Gold unit at CES, but are aiming for an 850W - 1000W fully modular PSU in the original 140mm ATX spec size. The advantage of course are less space taken up inside your case and a little bit less weight. There will be a premium on pricing though in the short term but they hope to be able to make it more reasonable over time. The Air Penetrator series of fans are one of the best performing units on the market. Silverstone's own high performance cases use them. They are launch a unit called the AP182 that spins from 500 - 2000RPM in a 180mm size. A new fan motor and design was required to accomplish this and it will still be quiet and provide their FT series and RV series users a high performance upgrade. Hopefully they create 200mm and 230mm versions so that we can upgrade other cases on the market. Expect to see this hit for about $30 US and in stores around March 2012.